The Historical Society of Windham County is pleased to announce the Grand Opening of the West River Railroad Museum in Newfane, Vermont. Since the purchase of the Station in 2014, The Windham County Historical Society has been restoring the Depot Building and its associated Water Tank House. Watch the Grand Opening on October 14, 2017 at the Historical Society’s Youtube: https://youtu.be/SsdbEY74TFw. The day has also been documented by Brattleboro Community Television and is available for viewing on BCTV’s website. 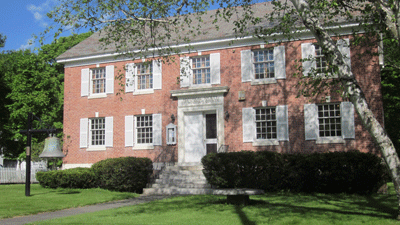 The Historical Society of Windham County is fortunate to have an extensive collection of West River Railroad artifacts, manuscripts, photographs and documents that will be housed in the new Museum. The restored Railroad Station provides a visual and accessible presentation for a broad audience as well as an engaging teaching tool for educators and parents. School groups are welcome. Construction of the narrow gauge railroad began in 1878, initially financed by bonds issued by the West River valley towns. 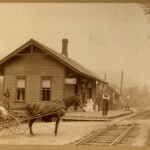 Completed in late 1880, the track ran from Brattleboro to South Londonderry, with the passenger trip scheduled to take 2 hours, a vast improvement on the 2 days by horse. However, the train was frequently delayed by wrecks or derailments, snowdrifts, washouts or boulders on the track, and became known locally as the 36 miles of trouble. On July 30th 1905 the road was converted to broad gauge in a single day by a workforce of 350 men. But, with cost-cutting on the roadbed, and equipped with inadequate old locomotives and rolling stock, the improvement was questionable. As complaints continued and patronage declined, service was reduced by 1920 to a mixed passenger and freight train only. Then the flood of 1927: 3 bridges and large sections of roadbed were washed away and the track was twisted or buried under mud. Essentially this was the end of the railroad; however, valley residents were not prepared to let it go. In 1929 they went to the legislature and secured a $200,000 loan to rebuild under new ownership. It was not a success. The line limped on with few passengers, little freight and sporadic service until 1936 when it was finally abandoned, torn up and its assets sold at a great loss. The Historical Society of Windham County has published this account of daily life in and around Newfane, Vermont with special detail and illustrations about the West River Railroad, a narrow gauge line at the time of the diary’s writing. 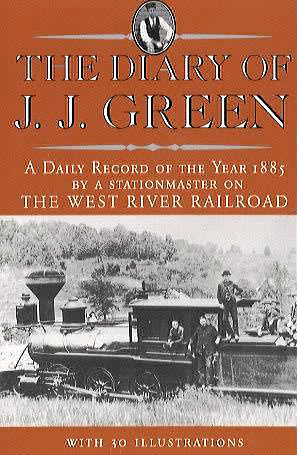 J.J.Green was a prominent citizen and stationmaster in the very picturesque Newfane village. He was a director of the Windham County Savings Bank and led an interesting life. This diary’s time frame is the year 1885 that runs up to his death in the sensational ‘Wreck At Three Bridges’, where the train plunged into the confluence of the West and Connecticut Rivers (1 of 2 pictured left). 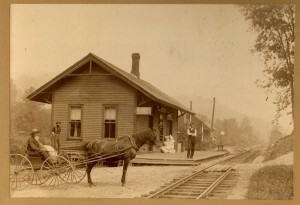 This 108 page, soft-bound book includes 30 photos of railroads, bridges, historic buildings, the stationmaster at the depot (pictured above) and 2 maps for locating the pictures including the existing depot at Newfane. Click here for a story featuring remembrances of the West River Railroad. The article was published in 2003 for NEWFANE REMEMBERS, a volunteer project dedicated to collecting and preserving the recollections of residents about life in town in times past. This installment was written for the project by Castle Freeman, Jr., of Newfane, and is reprinted here with the author’s permission.